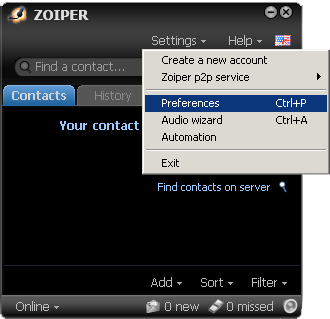 ZoIPer is a multi-platform softphone offering a free version with many useful features. This softphone has been tested and shown to be stable in Windows, Linux, and OSX. This setup guide is based on Version 3.2.21357 of the ZoIPer softphone software, although most other older and newer versions should look very similar. 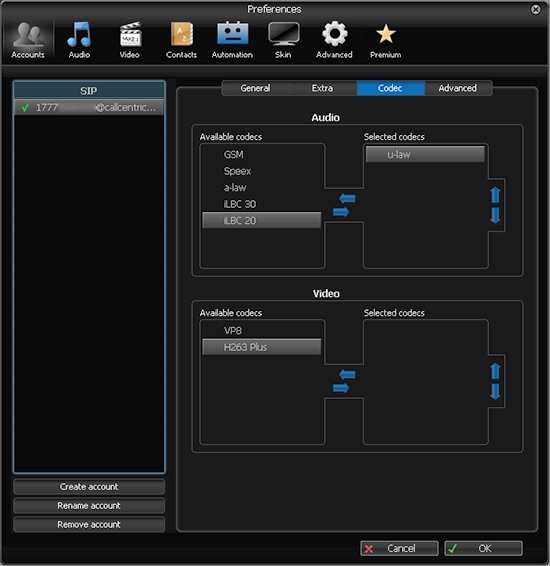 This setup guide assumes you have properly installed the application on your operating system of choice and have gotten any audio issues resolved before attempting to configure ZoIPer for use with Callcentric. Configuring ZoIPer should be fairly straightforward. Here we will walk through a basic configuration which should allow you to use your ZoIPer installation to place and receive calls using your Callcentric account. 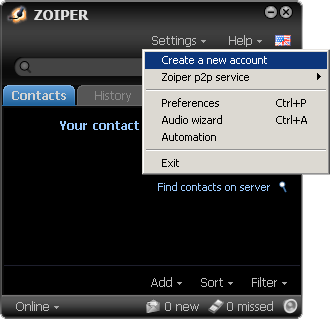 STEP 1 Open the Zoiper softphone application and click on Settings on the top menu bar, and click on Create a new account. STEP 2 This should bring up the Account Wizard window. 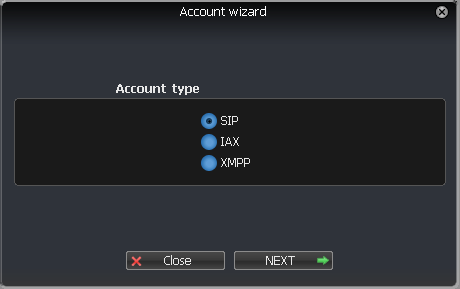 Select SIP as the Account Type, as indicated on the screen shot below. Click Next to proceed. STEP 3 Next, you will be prompted to enter in your Callcentric SIP credentials. On the given fields, please specify the following, as indicated on the screen shot below. Click on Next to proceed. 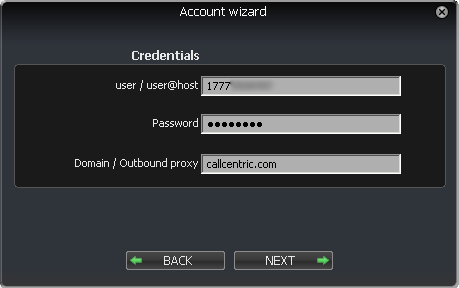 user/ user@host This is either the default extension 1777MYCCID OR 1777MYCCIDEXT, where 1777MYCCID is the 1777 number assigned to you by Callcentric and EXT is the three digit extension you are trying to register this UA to. STEP 4 You should be prompted to specify an Account name, as well as an option to Skip auto-detection. For these options, please specify the following, as indicated by the screen shot below. Click on next to complete account wizard. 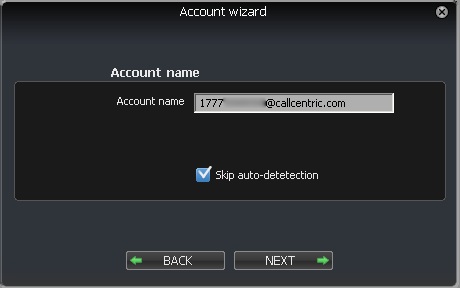 Account Name This is either the default extension 1777MYCCID OR 1777MYCCIDEXT, where 1777MYCCID is the 1777 number assigned to you by Callcentric and EXT is the three digit extension you are trying to register this UA to. Auth. username This is either the default extension 1777MYCCID OR 1777MYCCIDEXT, where 1777MYCCID is the 1777 number assigned to you by Callcentric and EXT is the three digit extension you are trying to register this UA to.